I can’t seem to make up my mind at the moment when it comes to nails. As a lover of nudes and pinks, but unable to resist some seasonal polishes, this #maniMonday selection seems to be quite a random selection! After my Morgan Taylor manicure (read about it here) I’ve been loving the Simply Spellbound shade when I need a classic, chic nail. 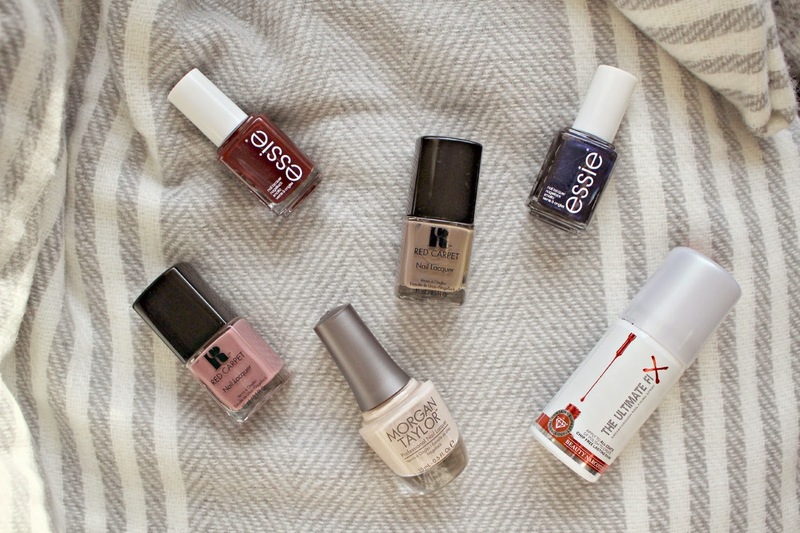 It’s a long lasting polish and the one I reach for when I need a nail that will go with everything! Other neutral favourites recently have been by Red Carpet Manicure, and in particular their ‘Expresso Yourself‘ shade (centre) and ‘Envelope Yourself‘ (left) which both also look extremely elegant and glossy. I’ve been a fan of Red Carpet Manicure since trying out their UV Gel set, so was really pleased to discover they did normal polishes too and in a great colour selection. They are just £8 each and you can now buy them from Debenhams. Essie‘s seasonal shades always catch my eye (usually from someone else’s Instagram!) and this year I couldn’t resist their new Berry offering, in the shade ‘Bourdeaux‘ and also a midnight blue shade called ‘Style Cartel‘. Both are classic Autumn Winter colours, and while I have loads of Berry tones, the Navy shade is my first dark blue polish so I’ve loved experimenting with it. They’re part of the Autumn collection, available on their website here. Both look lovely with a gold glitter accent nail, Essie also have a beautiful sparkly polish called Rock at The Top which is on my wish list for creating a super glamorous accent nail. Finally, a completely new addition to my nail routine is The Ultimate Fix spray by Beauty Narcotix. It’s an easy to use spray which gives long lasting, high shine results that are normally reserved for gel manicures, and the ‘Supaset’ Technology speeds up the drying time of your manicure. I love how easy it is to use, and have noticed that particularly my Essie shades have been lasting several days longer than usual. You just spray a light mist over each layer of polish and then allow nails to dry as you usually would. A 50ml bottle is £9.50 and you can purchase from Selfridges here. What are your favourite nail polishes for the Festive season?